Background: WTF? 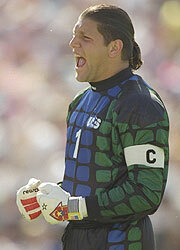 What is Tony Meola doing in my MLS Hall of Shame? He was a great keeper in MLS, who won titles, individual awards, and many, many fans. Well, I will tell you why he is here, and it has nothing to do with his utterly un-majestic pony tail. It’s because Meola allowed 62 goals in 1998, a long-time MLS single season record. Career: Meola had a legendary career in both MLS and for the US Nats. He plied his trade for New York and Kansas City, and he started over 200 games. He’s second all-time in shutouts and saves, and a member of many All-Star teams. But, he also leads MLS in losses (109) and in 1998 he didn’t seem to stop many shots for the MetroStars. Dishonors: That season wasn’t kind to Meola or the MetroStars. Later, he would be named league MVP with the Wiz, but back in 1998, he didn’t have a very good defense, so every game he faced a firing squad. That year, he conceded nearly 2 goals a game, and the MetroStars didn’t fare too well. I feel bad about putting him here, yet it had to be done. Legacy: Meola is better remembered today for his pony tail than for his goalkeeping, which is a shame because he was one of MLS’s best GKs. His 1998 season has landed him in my Hall of Shame, but he will likely be a future Hall of Famer as well. All in all, Meola may not deserve this dishonor, but I couldn’t resist the idea of a bust with his pony tail sitting in my H.O.S.